The second episode of the Legacy of the First Blade DLC continues pretty much where the last one, Hunted, left off. This time Kassandra is summoned to Achaia to help Darius and his son, Natakas with another strand of the Order of the Ancients – The Order of the Storm. Titled “Shadow Heritage,” it adds a new Hunter ability, some legendary gear, and a new flame-thrower that is fitted to the front of Adrestia. It is a slightly better DLC entry than the first, however, it still suffers the same issues, namely that in the small microcosm of DLC story, much of the wider game mechanics are exposed a little. 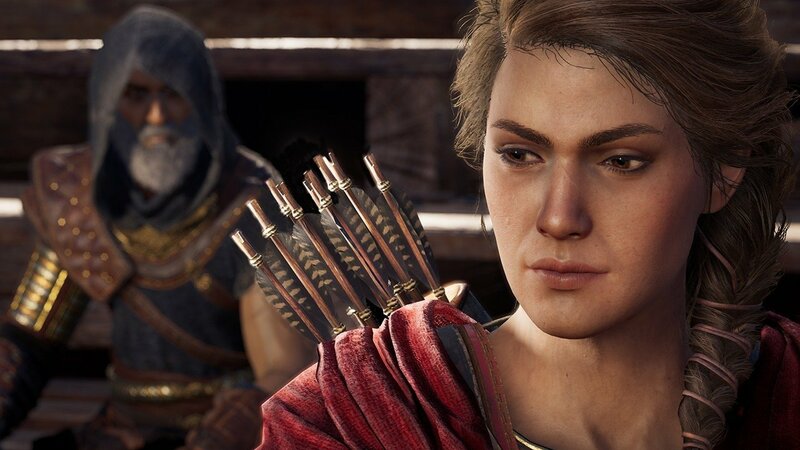 There seems to be a theme running through Assassin’s Creed Odyssey that isn’t quite as fully realised as it wants to be – the main campaign had Kassandra trying to answer some high-level philosophical questions about the value of one life over another, the value of free speech and even if a slave can still find joy in their life without freedom. 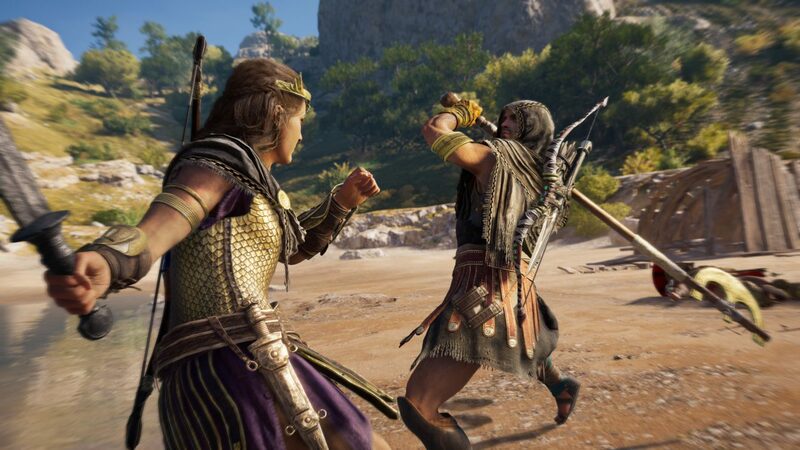 Each of these questions, while asked, never really go anywhere meaningful – perhaps, in part, because Kassandra is controlled by the player and their actions will overrule any chance of reconciliation that she may have. In Hunted, Kassandra is forced into a period of self-reflection as she is confronted by the family members of those she has killed throughout her time as a misthios, and even seems to regret what she has done, however, in the very next quest she is back to slaughtering everyone who gets in her way. Shadow Heritage also sees Kassandra looking inward and questioning how long she can continue with this mercenary life, but whereas previously player choice in the past has made a mockery of her introspection, the ending of Shadow Heritage removes any illusion of player agency with a baby to continue the Assassin legacy. The baby, of course, is inevitable as the lore of Assassin’s Creed has kind of forced the point that each Assassin is connected through a blood line. Where this falls down narratively though, is that all the work of the main game about free will is rendered moot and, furthermore the whole idea of Odyssey as a game incorporating RPG elements and adding player choice that can impact the overall outcome of the main story doesn’t work in this DLC as there is no way Kassandra won’t have a baby. Whether this child is the product of a love story between Natakas, or one born out of necessity to continue a bloodline doesn’t matter because the illusion of player choice has been exposed so wholly. Narrative hiccup aside, Shadow Heritage is a slightly more enjoyable campaign than Hunted, in part because much of it is carried out on the water with a new item – the Chimera, attached to the front of Adrestia. I tend to find the ship to ship combat a little tedious, however, with the addition of the Chimera – a flame-thrower – fighting enemies on the water was particularly satisfying. Shadow Heritage has you following the same format as the first instalment. You are summoned to Achaia to help your friends who are being terrorised by a naval captain called The Tempest. Throughout a number of quests, and by hunting down the other members of the Order of the Storm, you slowly begin to learn their identity and are ultimately asked to destroy them. It’s all pretty straight-forward, and throughout the course of the few hours you learn a little more about Darius, and his son Natakas. For practical purposes, like Hunted, you will need to have completed Chapter 7 of the main story campaign. Completing the DLC and killing all members of the Order of the Storm will give you some legendary gear including a weapon called the Judgement of the Lion which will grant the player health on each successful parry. Shadow Heritage also brings with it a new ability in the Hunter tree called Rapid Fire that allows you to utilise adrenaline to fire arrows very quickly. Successive upgrades to the ability allow you to perform this action with any arrow type and also increases Hunter damage. On paper it seems like a great ability, however in action it is a little difficult to use effectively. The Legacy of the First Blade DLC so far has been a little disappointing. Shadow Heritage is slightly better than Hunted in that the narrative feels less disjointed than the first instalment, but the ending undoes a lot of the work of the main campaign which is a huge shame. 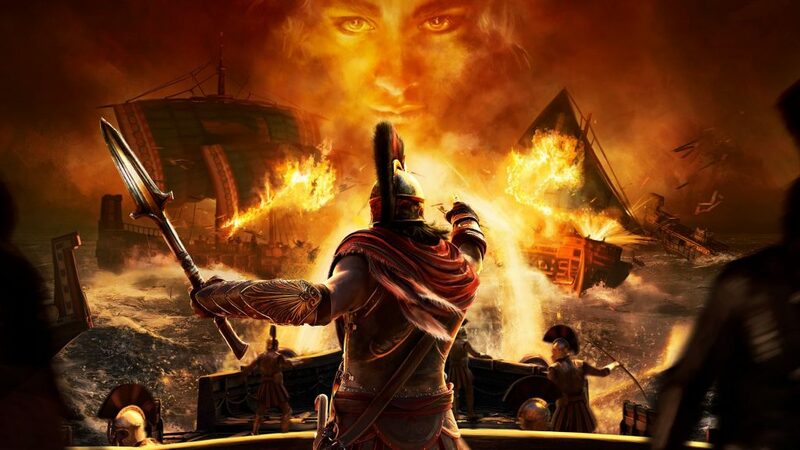 The focus on naval battles, something that would usually put me off, works really well though, and provides something a little bit different from the usual hack and slash. The flame-thrower on the front of Adrestia is a lot of fun, and actually makes the ship-to-ship combat something I will actively pursue. There is still time for Ubisoft to turn this DLC around with the third instalment due out soon, however so far it has been a little underwhelming. Read our guide on the Daughters of Artemis questline here.